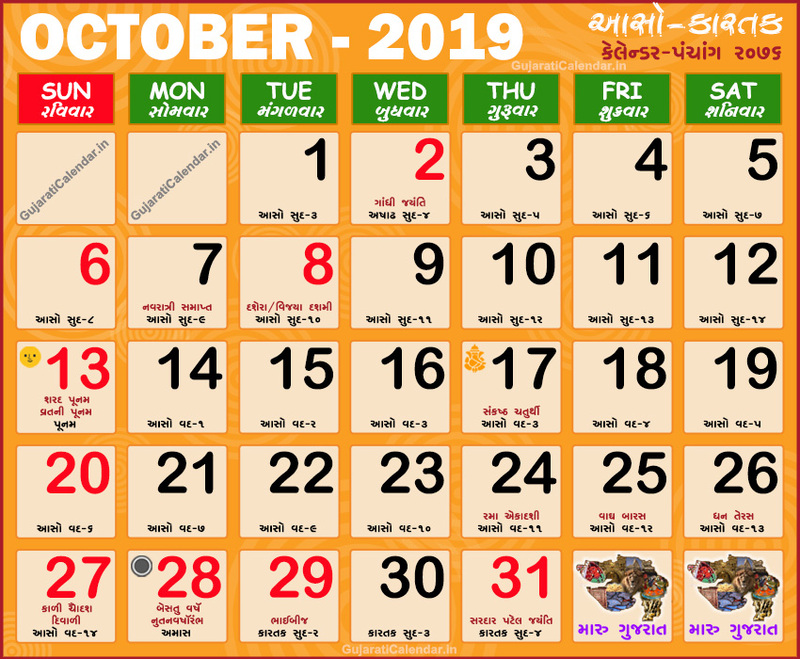 Gujarati calendar 2019 October showing festivals, holidays and tithi. October corresponds to the Gujarati months of Aaso Kartak. Gujarati Calendar 2019 October, Gujarati month Aaso and Kartak is the months of Hemant Rutu or Prewinter. It is it perhaps the most pleasant time of the year, weather-wise. It is time for some of the most important Hindu festivals, including Navratri, Vijayadashami, Sharad Purnima, Diwali, the festival of lights, Bhai Dooj, and a number of new year's celebrations. Gandhi Jayanti, Sardar Patel Jayanti also comes in this month. October 2019 is an aaso kartak mahino in vikram samvat 2075-2076.